"Divlja gradnja." This is the term in the Serbian language usually used to describe illegal construction. Since 2004 and the Congress of Vienna, a forum dedicated to this theme in Eastern Europe, the term "informal construction" has come into use. Belgrade is a city practically half of which has been built in an "informal" way. According to statistics from UN-HABITAT (the United Nations agency dedicated to housing issues) for 2006, 43 percent of the structures used for housing in the Serbian capital were constructed illegally. Officially, that means about 200,000 homes. 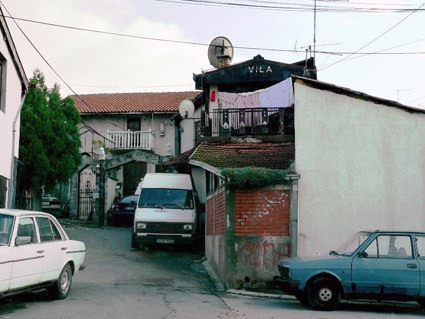 "Chaotic building" ranges from single-unit structures with a second floor built without permission to actual encampments; from Roma slums (census records show 125 in Belgrade) to neighborhoods of villas and luxury homes where, even though the streets are often battered and impassable by car, as soon as one passes through the garden gates, the homes and lawns are perfectly manicured. "This type of housing solution is found in all of the large cities like Belgrade and Novi Sad," explained Zlata Vuksanović, project manager for UN-HABITAT and an expert in informal settlements. "There were accelerations in this phenomenon during the Balkan wars because of refugees from Bosnia and Croatia and evacuees from the war in Kosovo." But it would be a mistake to consider divlja gradnja a phenomenon linked only to the wars of the 1990's. The issue is more about an entire mode of development resulting from the weak capacity of the system - socialist and, later, post-socialist - to provide for the basic housing necessities of a society which has changed profoundly in recent decades. "Illegal constructions began en masse in the seventies," continued Vuksanović, "when the industrialization of the country caused a mass migration from the countryside to the cities. In those years, the state did a lot of construction: Novi Beograd was built with up to 10 thousand apartments rising in one year, but even this frenetic pace proved insufficient. Many people set up dwellings on the outskirts of the city. According to a law which is still in force today, properties within the borders of and belonging to the municipality could not be privatized, but agricultural lands could be freely bought." These new residents, therefor, bought a piece of property on which they built their own houses without permission. In Belgrade, the most striking example of this type of development is Kaluđerica, a town of 20-thousand inhabitants which rose, without any type of urban planning, beside the highway to Niš on the south-eastern periphery of the Serbian capital. "It was an optimal location," continued Vuksanović, "because there was no risk of penalties or demolition and, at the same time, it was close to the city. Now there are also some services, like a school and a medical clinic, but for many years Kaluđerica had huge problems with electricity, running water, and trash collection and even now it isn't very well served." With the wars, above all the war of 1999, Serbia found itself having to manage another demographic bomb: after its war with Kosovo, 10 percent of the country's population was considered refugee or IDP (internally displaced persons, or refugees, from Kosovo). But the state did not have the means to provide for the needs, especially housing needs, of these people except for to create insufficient and poorly-built collective residency centers. Those who could took matters into their own hands and constructed houses on agricultural lands. Ivan Kucina, professor of architecture at the University of Belgrade, has studied the phenomenon of illegal growth in the city for many years. According to Kucina, this mode of development is the result of many years of isolation and embargo which brought about a normalization of a type of "gray" economy, also for real estate, which is not limited to the less fortunate social classes. "With the end of the war," said Kucina, "things did not change much and independent and illegal construction has continued. Only the scale has changed: now investments in the houses are much larger." The state has made various attempts at keeping the phenomenon in check. In 2003, a law was passed which aimed to regulate illegal structures and severely fine those built in the future, rendering illegal construction a violation punishable by law. But, in practice, the law failed on both fronts. The percentage of those who opted to build according to the new regulations was very small and "informal construction" continues. Even today, a court trial for illegal construction has never been held. "150- thousand illegal buildings went up between the nineties and 2003," Kucina said, "and between 2003 and today there have been 50-thousand. That means a total of two hundred thousand illegal houses, and that's counting only the ones we know about." "The problem of the law of 2003," explained Vuksanović "is that, on the one hand, the terms for regulation were too rigid, and on the other, the municipalities did not have the capacity to administer this process. The law simply collapsed on itself." According to the expert from UN-HABITAT, informal settlements cannot be treated solely a problem of planning: a multi-sector approach is needed. "Rich and poor can't be put in the same plan. Building a house for a family and building one for profit are not the same things. In Zarkovo, for example, some builders built an apartment building of six or seven levels with a plan to sell the apartments, even though they knew they didn't have a building permit. These new owners must now pay to legalize the building, while the original builder, who profited from the deal, has now disappeared." It is a great cover, if anything, for money laundering. Despite its divlja gradnja, Belgrade suffers from a housing shortage. There are 30 percent fewer houses available per inhabitant compared to the median number in the rest of South-East Europe. This results in a price per square meter ranging from two thousand to five thousand Euros. Another matter entirely is that of Roma settlements. The oldest ones date back to the ancient layout of Turkish Belgrade and were made up of mahale: neighborhoods inhabited by people of the same ethno-religious and professional groups. During the course of the city's successive industrial development and the reorganization of the capital, the mahale disappeared. 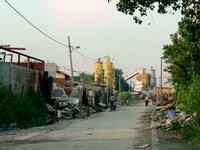 The only exception were a few of the Roma settlements like Orlovsko Naselje a Mirijevo in south-east Belgrade. In the last 30 years, slums have developed where Roma families, who have been impoverished by various economic crises, wars and hits from multiple levels of discrimination, find shelter with the idea that, in the city, one can always find something to do to survive. Some slums lie in the centre of Belgrade on top of valuable real estate. One is "Deponja" (literally: 'dump'), an extremely dilapidated settlement which stands between cement factories and an illegal dump. Roma people have lived there for three generations. The area, close to a bridge leading to Pančevo, belongs to the port of Belgrade. Control of this area is contested by two powerful parties currently facing off in court: the very powerful tycoons Milorad Mišković (of Delta Holding) and Milan Beko (who bought the port at rock bottom prices and would like to convert it into a residential-commercial zone, with enormous profits) and the Municipality of Belgrade, which would like to maintain the port's original function. But this is another story: that of the "legal" city.